Among the corporate tax shirkers this eye-opening new study spotlights: Starbucks, Honeywell, McKesson, and Walmart. Guess which way lots of CEOs are leaning. Better yet, read Fleecing Uncle Sam, the just-released report from the Institute for Policy Studies and Center for Effective Government that tallies up the choices top CEOs are actually making. This new Fleecing Uncle Sam study looks at the 100 U.S. corporations that last year shelled out the most in CEO pay. Of these 100 companies, 29 paid Uncle Sam less in taxes than they paid their CEO in compensation. And the CEOs at these 29 companies — major outfits like Boeing, General Motors, and Verizon — pulled in handsome paychecks for those billions in profits. 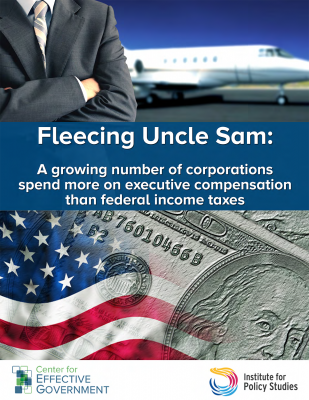 The CEOs averaged, note Fleecing Uncle Sam co-authors Sarah Anderson and Scott Klinger, an impressive $32 million each. Corporations have no magical super powers. They do have friends in high places. Just how much tax shirking are corporations doing? The new Fleecing Uncle Sam report offers one suggestive clue. If the seven largest U.S. firms that pay Uncle Sam less than they pay their CEOs had paid taxes last year on their profits at the standard 35 percent U.S. corporate tax rate, the study calculates, these seven companies would have owed $25.9 billion in federal taxes. In real-life 2013, these seven corporations, taken together as a group, didn’t pay any federal corporate income tax. Instead, notes Fleecing Uncle Sam, the seven gobbled up $1.9 billion in tax refunds. The difference between what they could have paid in taxes and what they claimed in refunds: $27.8 billion. Ending corporate tax shirking could make free pre-K a reality for every four-year-old in the entire United States. But CEOs don’t have to sweat that higher rate right now, thanks to still another convenient tax loophole that Fleecing Uncle Sam co-author Scott Klinger examines in another study released earlier this month. Various pieces of legislation designed to end the corporate tax loopholes that let America’s CEOs stiff Uncle Sam — and get fabulously rich in the process — are now pending in Congress. Fleecing Uncle Sam has the particulars on all these legislative initiatives.